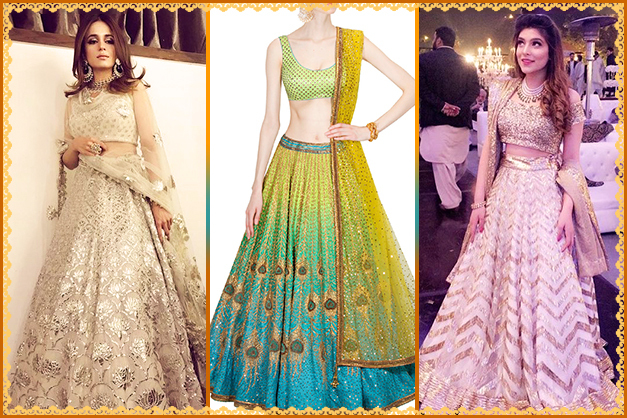 An Engagement outfit should be dreamy and pretty, be it a gown or lehenga! There are so many designer labels that lets you experiment with new trends on your engagement day. We’re here to make that job easier for you. 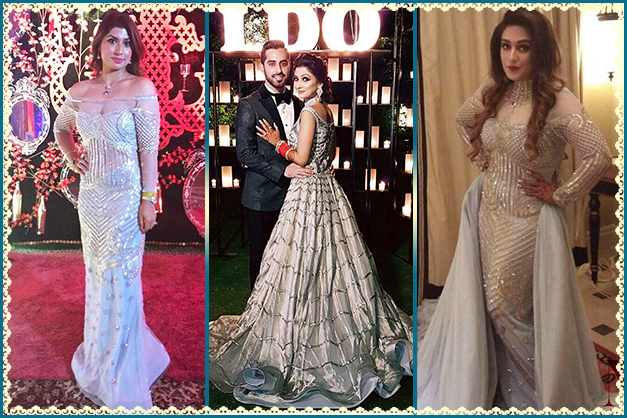 Here are some popular designers which you can choose for your engagement outfit. This designer duo is known for their seamless integration of the Indian tradition and western expression. 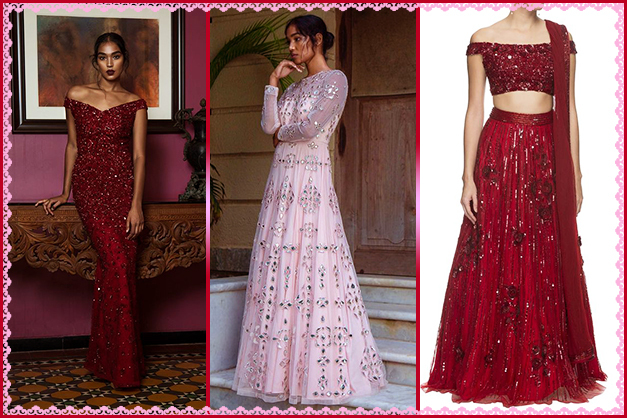 Their Demi-Couture Gowns, Contemporary Lehengas, Concept Anarkalis and ethereal Sari Gowns are perfect for the bride who’s looking for a perfect outfit for her engagement. 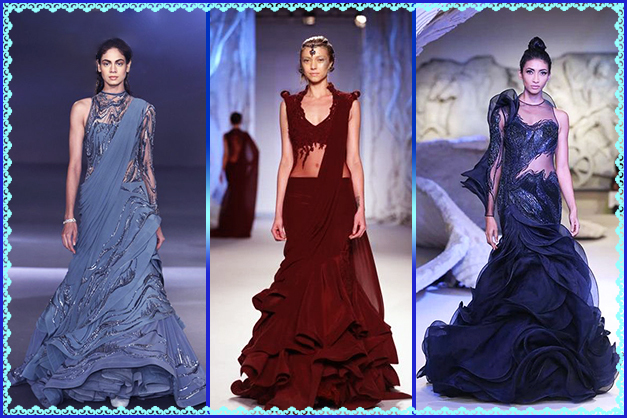 If you are looking for something more dramatic or voluminous then Gaurav Gupta’s outfits are the best option to go for. His splendid gowns and lehengas are made very closely with lines and the motion of the fabric. The embroideries are done in three dimensions, whereas volume, play and extempore draping have created a signature look of his classic attires. Tarun Tahliani never misses a chance to awe with his stunning pieces. He is known for offering a unique combination of historical opulence and contemporary chic also transcend to couture. His designs are very much rich in beautiful silhouettes as well as lovely embroidery. 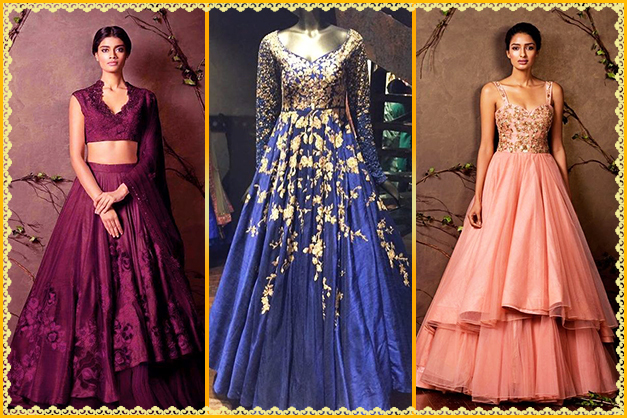 If you are thinking of donning a lehenga on your engagement that don’t think twice before choosing an attire from his collection. This designer duo is best known for their revival and reinvention of ancient techniques as well as embroideries including Chikankari, Zardozi and Tharad. Their modern masterpieces are a favorite amongst the new era brides. 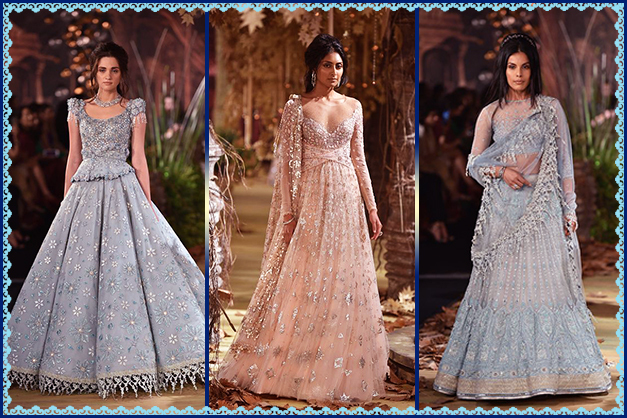 Their unique gowns and lehengas comes alive with exquisite embroideries and intricate embellishments. 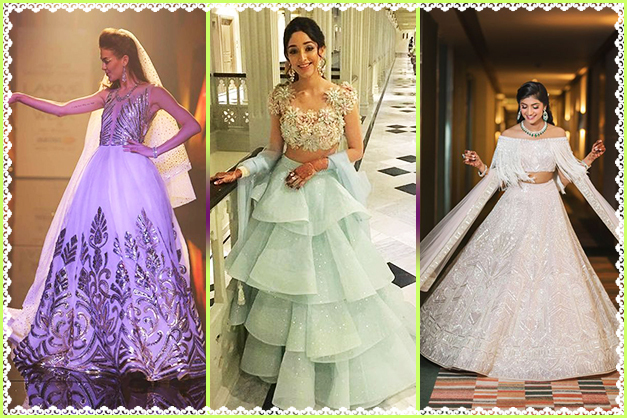 Manish Malhotra is a star designer and words are really less to explain the grandiosity of his ensembles. 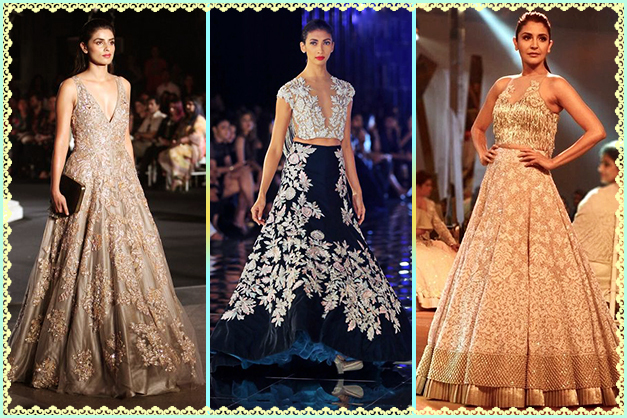 His lehengas and gowns adorned with impeccable embroidery and fabrics which are totally droolworthy. This designer duo label is known for its bridal couture, wedding wear, occasion wear and east meets west Indian wear. 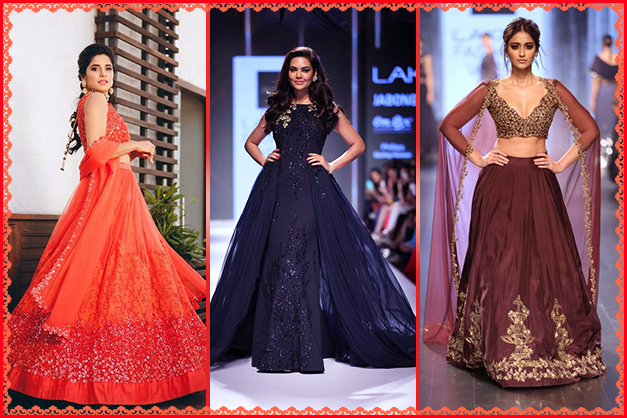 The brides can choose from their wide collection of gowns or lehengas for their engagement. The collection by Ridhi Mehra portrays the charm of the Old World. Her ensembles defines a have a fusion of vintage, imbibing European with the traditional Indian aesthetics. She also offers a mesh of custom-made couture creations that will look best on engagement functions. Diva’ni is India’s first cinema-inspired ethnic wear fashion brand, brought to you by Yash Raj Films and KBSH Private Limited. They have a rich collection that is also seen on the leading ladies of Bollywood. Nikhita Tandon is a young and vibrant Fashion Designer from Delhi that seeks a universal appeal with her collection in Pretline, Red Carpet Collection and Dresses. 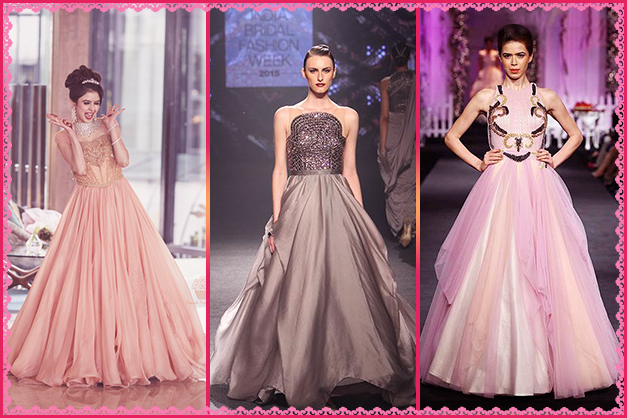 Her gowns are totally breathtaking that will surely create a statement if you don them on your engagement. Nadine Dhody’s brand NADINE is an exclusively crafted, luxurious, Indian and western wear label made for the contemporary woman. It is a contemporary Indian brand that focuses on occasion wear that entails everything from evening gowns to Indian lehengas and more.